With old man winter finally returning to his deep slumber and spring starting to show her beautiful face, it’s time to upgrade your wardrobe from boring neutrals to bright colors and fun patterns to celebrate the changing of the seasons. 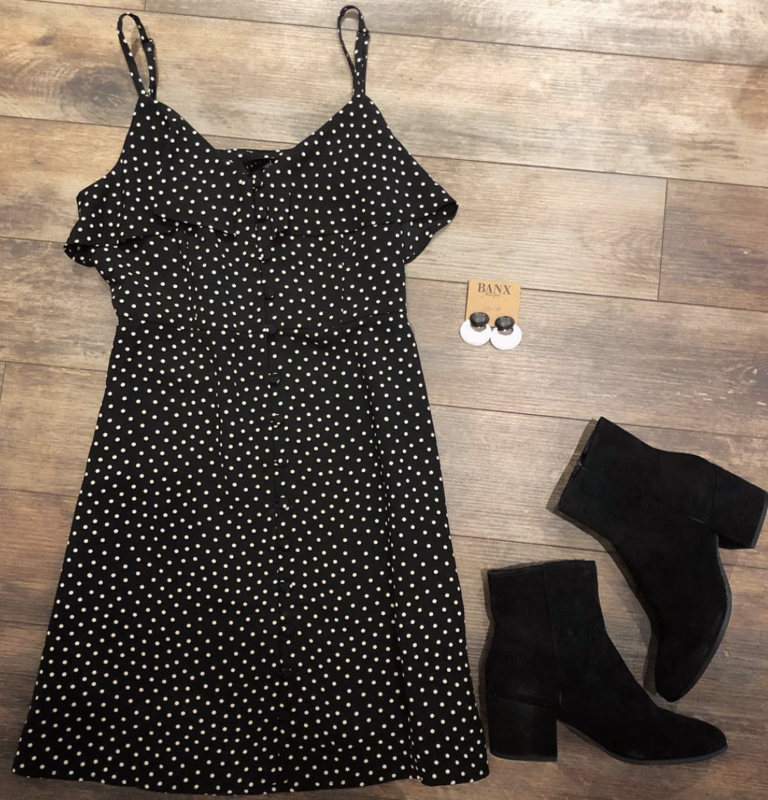 The friendly staff at Scout and Molly’s Boutique located in Paoli have put together three of our favorite picks of the season that are sure to have you looking stunning throughout the entirety of Spring 2019! Dark blue with tiny polka dots underneath speaks to the playfulness of this dress. The soft straps up top and floating fabric make this dress look frilly, fun, and flirty. This is the sort of dress you can pair with anything from bare legs to cute leggings. You could wear it with cute sneakers in the spring and can dress it up or down for a night out on the town with the gals or a night in with your special guy. Dressing for spring and summer is a lot of fun because you can play with shapes and colors. 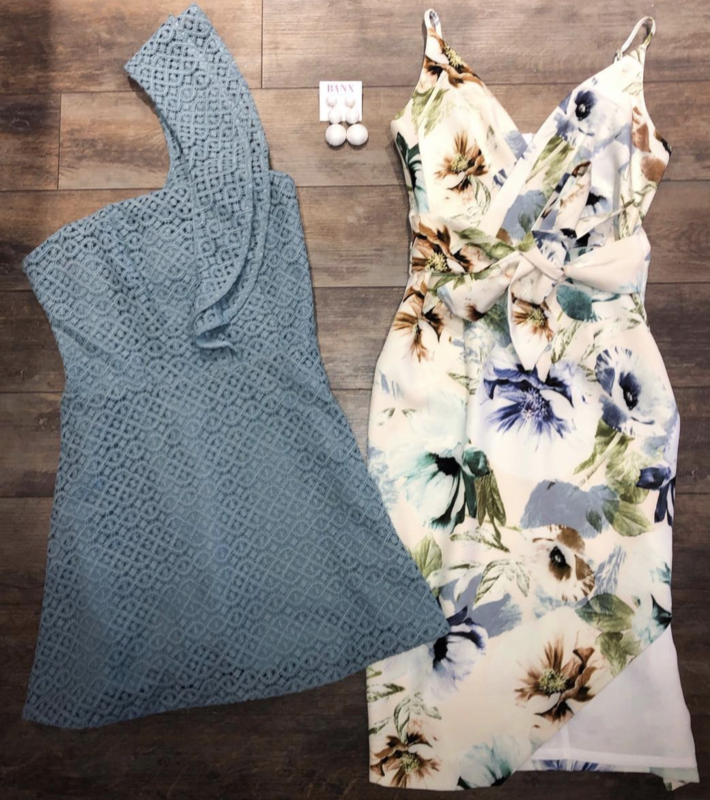 This set of two dresses could help you look your best for any event in the spring and you should try them both when going out over the weekend. This blue on the off-shoulder dress is very inventive and will be sure to make people want to do a double-take when you pass by. The blue isn’t completely blue and it features shades of greens that are exciting to find in the sunlight. This midi dress has the perfect white background with a swath of flowers that anyone would love to wear. This dress is exciting because it allows you to be playful while also being formal. You can pair these dresses with some amazing accessories like simple bead earrings that will stand out just enough. This is a great look for when you have gone to the beach for a week and you’ve finally got a start on your summer tan. These soft jeans from Black Orchid will hug your shape just right while this lightly colored lightweight tunic top is great for relaxing in the park or enjoying a picnic in the warmer spring weather. Throw this top over a cute bralette for a super-casual look or dress it up with some fringe heels for a night out. This is a great outfit for any lady who wants to look fun on the weekend and it gives you an option that is more than just a skirt. Come see your neighbors at Scout and Molly’s of Paoli today! We’re here to provide you with a personalized shopping experience that is sure to help you find new looks that’ll have you looking (and feeling) great all season long!